The goal of the second workshop is to leverage RStudio’s Git orchestration features. In the workshop I will interactively demonstrate reproducible report generation. 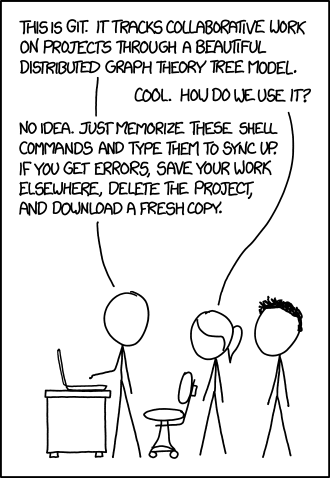 Reproducibility is a critical outcome of Data Management and using Git’s version control is a practical way to implement a more ideal workflow. This workshop is aimed at Git beginners because, especially if you have only dabbled with Git, Git commands can seem arcane. I really like RStudio’s simplified Git controls. By transforming the main Git functions into clickable buttons, RStudio reduces the need to memorize esoteric commands. This allows researchers to focus on workflow and productivity without sacrificing version control or collaboration. The workshop will offer a gentle introduction to Git via RStudio. Users will gain hands-on, practical experience creating and manipulating a repository. Attendees will arrive with their own laptop and be guided past the obscure Git configuration process. Upon completion, users will have configured their own laptop with Git, and learned how to leverage Git’s version control in repositories. The researcher will now be poised to collaborate or simply exercise public (and private) repository control. My workshop materials, Using RStudio to orchestrate Git, are currently available in draft. Ping me if you have thoughts or questions. The workshop is open to the Duke University Community. Following the in-person presentation, a public recording will be made available. I’m posting my resources for my portion of the workshop: Using RStudio to orchestrate Git – currently in draft. From this launch page you can find a link to my slides, the hands-on exercises, and an OSF Project link containing my co-presenter’s slides. Anyone can follow along at their own pace. You can find a full listing of my workshops and the DVS departmental line-up for the Fall 2017 workshop series is posted at the Data & Visualization Services Workshops page. You can also find a link to our past workshops and all the publicly available recordings and materials.